They see him rolling. They hating. Digg spotted a video that proves there is more than one way to get to your plane, which previously remained walking depressingly to your gate that you were assured was missing one delayed airplane. 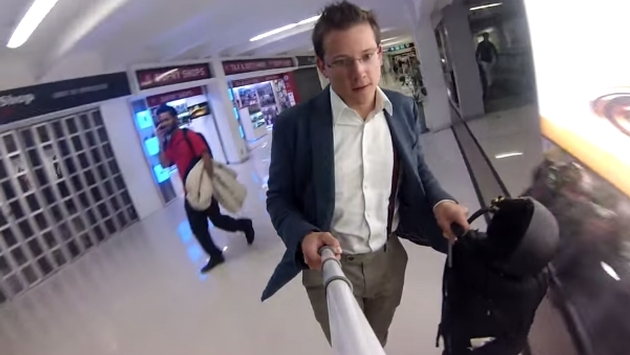 In any case, Jan Rezab used a GoPro to capture what he looks like riding around while wearing Heelys. For the uninitiated, Heelys is a rather insane set of footwear, featuring a wheel in the heel of the shoe. This allows people more adventurous or younger than I to glide around effortlessly. In fact, they are actually stupid; because I nearly broke my entire body the one time I tried them on. If you need me, I will be walking begrudgingly between gates like a normal person.